This evening I attended a little ceremony in downtown Woodstock. It was to show your support for the catastrophy that Japan has suffered, and that the Japanese people are being helped out by people from all over the world. The ceremony commenced at 7pm, and lasted just under an hour. There were a number of speakers who spoke their thoughts about recent events, and let the people know that their help is greatly appreciated. Speakers from local companies such as Toyota and Vuteq were there, and informed the people attending on the condition of their parent companies in Japan. There was a band and a few groups of singers who performed a few numbers for the decently-sized crowd. 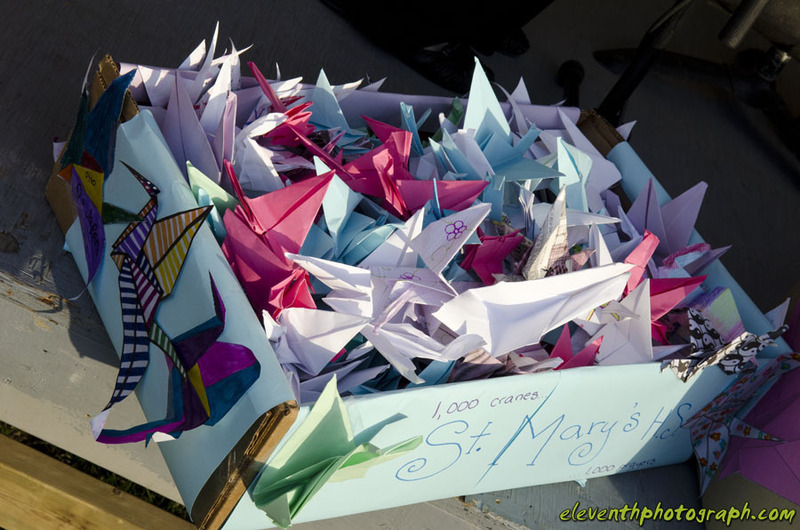 There were hundreds of cranes among several boxes and the weather held up great. The event went by succesfully. Our thoughts are with the victims of the disaster.